Hungarian jurist; born March 27, 1850, at Budapest, where he completed his education. Upon his graduation as doctor of law he resided abroad for several years. In 1882 he was admitted to the bar, and in 1885 became a lecturer on criminal jurisprudence at the University of Budapest. He later entered the service of the state as assistant district attorney; and in 1886 was appointed judge (Gerichtshofrichter) of the Court of Budapest, and in 1896 district attorney, which position he held until 1898, when he received the appointment of chief of division (Sectionsrath) in the royal Ministry of Justice. 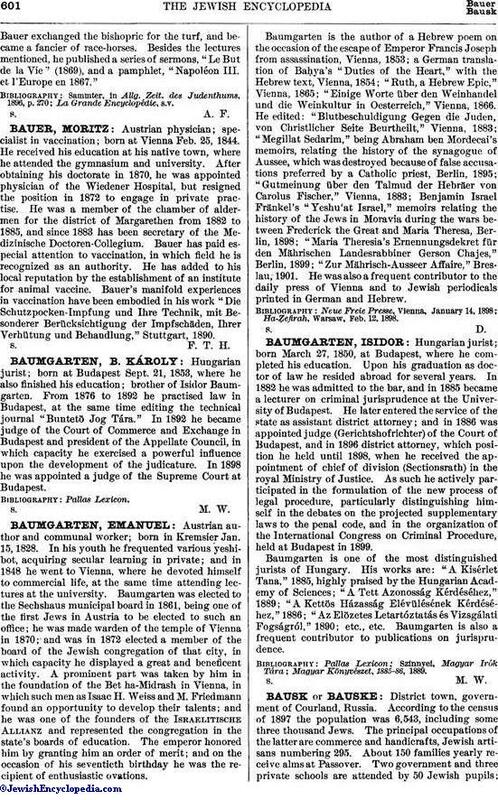 As such he actively participated in the formulation of the new process of legal procedure, particularly distinguishing himself in the debates on the projected supplementary laws to the penal code, and in the organization of the International Congress on Criminal Procedure, held at Budapest in 1899. Baumgarten is one of the most distinguished jurists of Hungary. His works are: "A Kisérlet Tana," 1885, highly praised by the Hungarian Academy of Sciences; "A Tett Azonosság Kérdéséhez," 1889; "A Kettös Házasság Elévülésének Kérdéséhez," 1886; "Az Elözetes Letartóztatás és Vizsgálati Fogságról," 1890; etc., etc. Baumgarten is also a frequent contributor to publications on jurisprudence.